The New Forest National Park on the UK’s south coast is stunningly beautiful and full of Instagrammable, picture-perfect views, sprinkled with the regions famous wildlife. Nearly 6000 New Forest ponies are free to wander the heather-carpeted heathlands, woods, villages and shoreline with views across to the Isle of Wight. 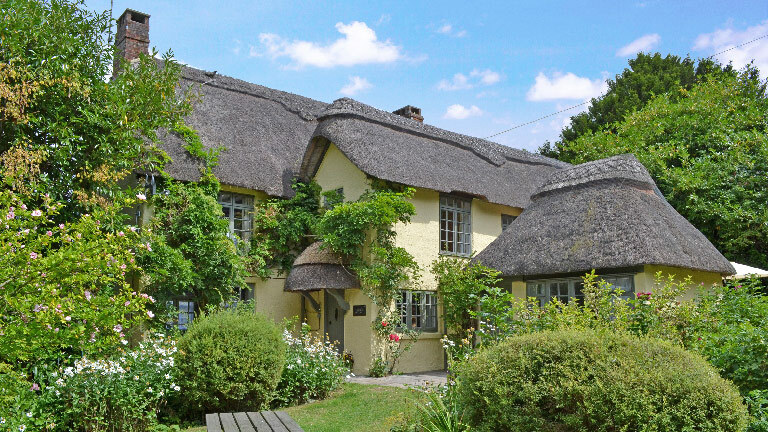 Beck Cottage (sleeps 12) hides 6 pretty bedrooms under its thick thatched roof, each decorated with chic, yet cosy, country furnishings. 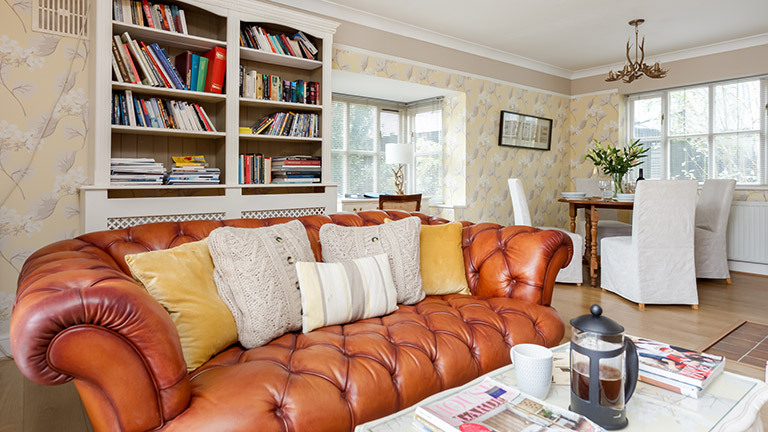 Beck Cottage, Fordingbridge, sleeps 12. Click here for more info. Clobb Copse (sleeps 4) is the epitome of style and design. 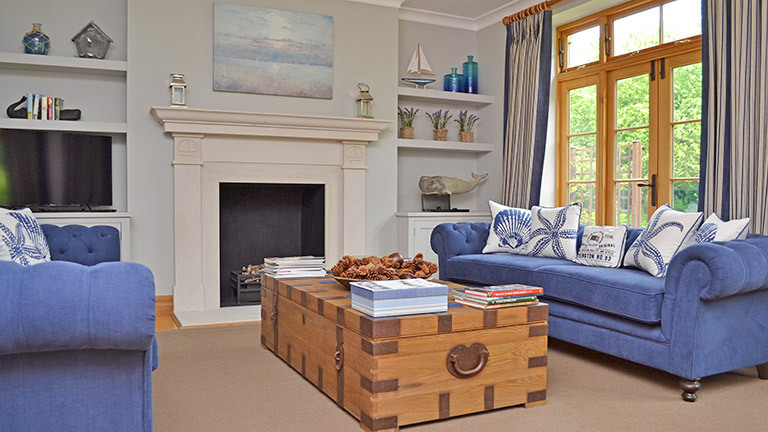 This gorgeous home is close to the privately owned Beaulieu River, and the décor flaunts a stylish mariner vibe whilst remaining homely and elegant. 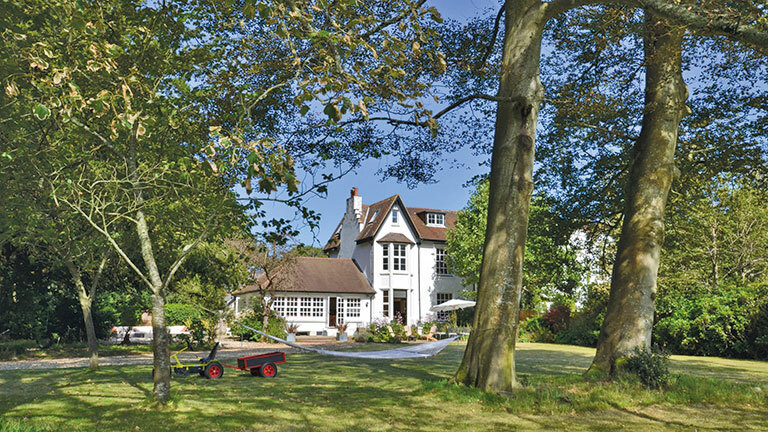 For exhausted kids and relaxed parents, choose Number Four, sleeps 5. The younger generation will be exhausted by bedtime after letting off steam at this sprawling pad. It has its own 1200 m2 sports pitch, secret den, adventure playground, go karts, plus a separate games room with table tennis/air hockey, darts and hi-fi. And for the parents? Sun-drenched patios, BBQ and plenty of comfortable sofas. Number Four, Hordle, sleeps 5. Click here for more information. The Hampshire Avon is famously known as one of the best fly fishing rivers in the British Isles and for good reason. Fishermen flock to this area on the hunt for mighty Salmon, Barbel and Trout amongst other prized species. But a stay in this deluxe cabin, surrounded by wonderful views, ticks all the boxes for a break away any time of the year. 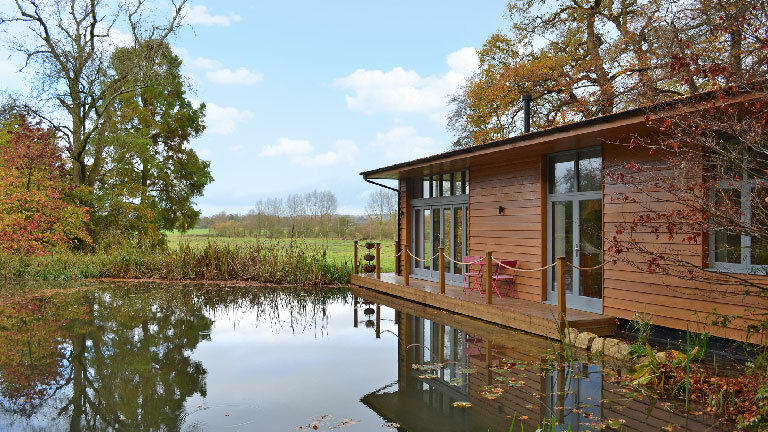 Riverside Lodge, Fordingbridge, sleeps 4. Click here for prices. Little Green is a cosy cottage for two, and the brainchild of British interior designer, Jayne McIntyre. But cosy doesn’t necessarily mean small. This sumptuous cottage is handsome and spacious, whilst also stylish and welcoming. 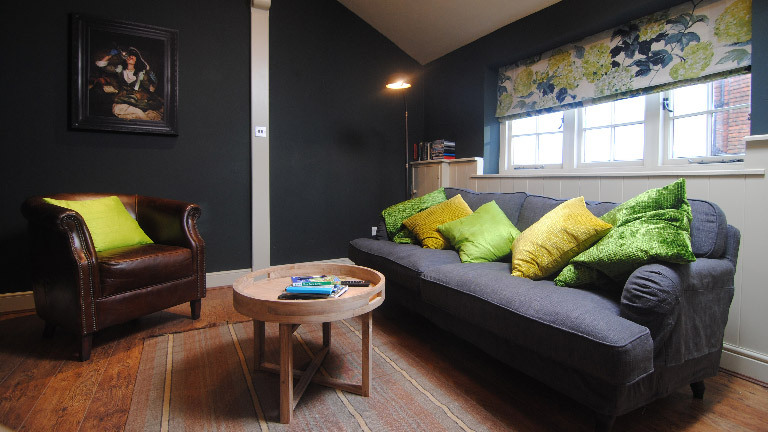 Little Green, Lymington, sleeps 2. Find out more here. That’s what lucky guests can enjoy when staying at the mighty Thatchby Oak. This enormous home sleeps 12 in six bedrooms. Inside there’s room for everyone, and in the warm summer days, head out to the garden and splash away the afternoon in your very own private, gated swimming pool. 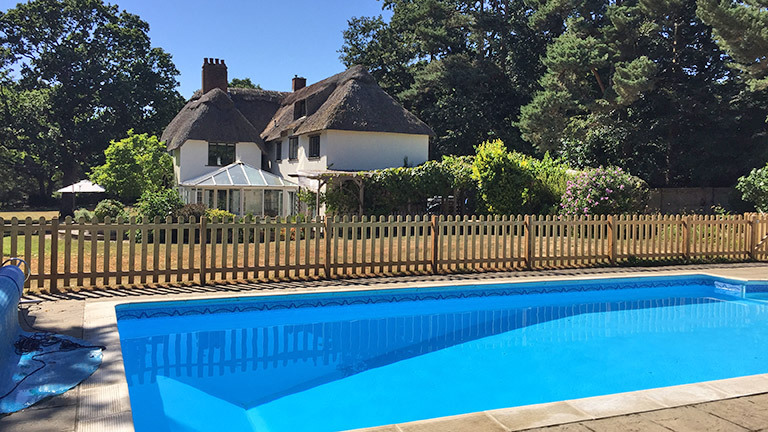 Thatchby Oak, Brockenhurst, sleeps 12. For availability and prices click here. Little ones who love Peppa Pig will love parents who book to stay at Bridge End Lodge as it’s so close to Paultons Park – home of Peppa Pig World, that they can buy a 2-day ticket! It’s a super pretty and comfortable place to stay for Mum and Dad too. Bridge End Lodge, East Wellow, sleeps 4. Find out more here.